People like to listen to music while working. But sometimes, we get distracted and carried away with the lyrics. In such cases, when you feel like listening to music but also have to stay focused or need to be calm; instrumental is a nice option to go with. With this option, you don’t have to try something new; you can listen to your favorite music. In this article, I will cover a free method to convert Spotify playlist to Instrumental. To do that, I’m going to use a free web application, called wordless. This application not actually converts songs to instrumental by removing vocals; because that would give karaoke like output which is not good for listening. Instead, it looks for the instrumental versions of songs on the web. How to Convert Spotify Playlist to Instrumental? 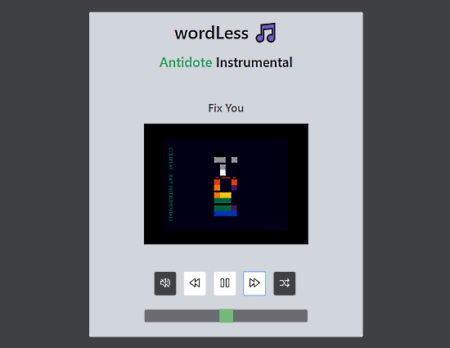 wordless is a free web application that finds the instrumental versions of songs from a Spotify playlist. It looks for the instrumental on YouTube and put all the songs it finds in a public playlist. To use this application, first, you have to connect it with your Spotify. To do that, you have to log in with your Spotify account. It works for both, free and paid, Spotify accounts. 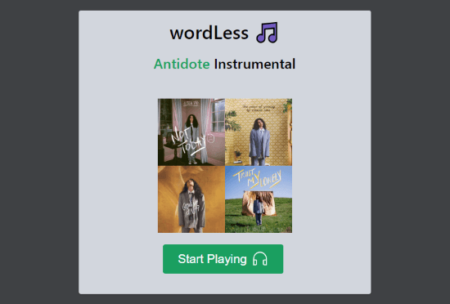 Once you logged in with your Spotify account, this application loads all your Spotify playlists and asks you to select a playlist which you want to convert instrumental. When you select a playlist, this application takes some time (less than 1 minute) to find the instrumental versions of the songs from your playlist. Then, it creates a public playlist with all the instrumental songs it could find on YouTube and gives you a link to that playlist. This new playlist has the same name as your original Spotify playlist with “Instrumental” added in the end. From this step, you can listen to this playlist. wordless loads it in a web player with YouTube video embedded in it. It gives you media and volume controls along with a shuffle option. Below the player, you can see which songs are in the queue. You can also share this instrumental playlist with others by its URL. 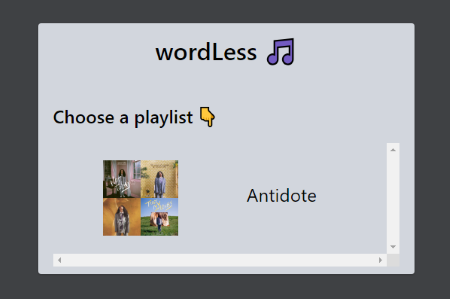 Give wordless a try here. 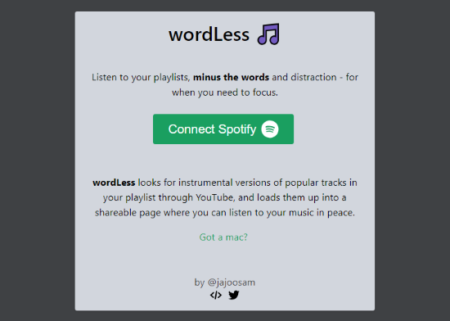 wordless is a nice app to listen to your favorite songs without words and distraction. It comes handy when you have to focus on your activity/work and don’t want to get carried away with the vocals. Try it yourself and share your thought on this with us in the comments.